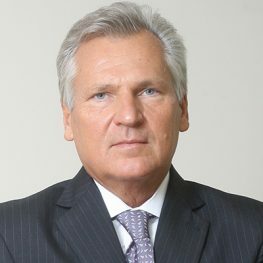 Aleksander Kwasniewski played an important role during the Orange Revolution in Ukraine, actively participated in the discussions held between Viktor Yushchenko and Viktor Yanukovych. He received the "Knight of Freedom" award for his merits in favour of a peaceful end to the Orange Revolution. In the years 1973-1977 he studied International trade at the Faculty of Transport Economics, University of Gdansk. Active in many student organizations and associations against the former government. In 1991-1995 he was twice elected to the Polish Parliment. He held the office of President of the Republic in 1995-2005.